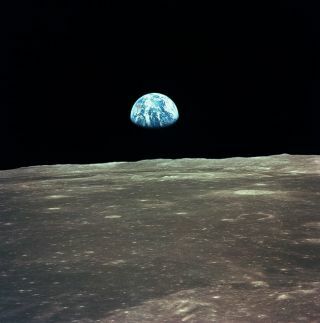 This Earthrise image was captured by Apollo astronauts in 1969. In 2018, companies may finally reach the moon. Billionaire entrepreneur Elon Musk announced Monday (Feb. 27) that his private spaceflight company SpaceX plans to fly two private citizens on a trip around the moon in late 2018. But this isn't the first time a private company has promised lunar vacations to private citizens. A trip around the moon for private citizens is also one of the offerings of the Virginia-based company Space Adventures. The company is responsible for sending the first space tourists to the International Space Station, with transportation provided by the Russian Soyuz spacecraft. In 2005, Space Adventures announced plans to send tourists on trips around the moon, also inside a Soyuz craft. In 2014, Space Adventures announced that two customers had paid the $150 million price for the circumlunar trip, although getting humans around the moon in a Soyuz vehicle would require major changes to the spacecraft, Space Adventures representatives said. The Space Adventures circumlunar mission would fly two passengers and one professional cosmonaut to the moon's far side, making a close pass by the lunar surface, according to the company's website. Musk said the passengers on the SpaceX Dragon trip will also make a close pass by the surface of the moon during their flight. The circumlunar trip is still offered on the Space Adventures website, although no specific price is listed. It's unclear if Russia's space agency is working on the necessary upgrades to the Soyuz for a circumlunar flight; a Space Adventures representative told Space.com the company does not comment on any client's prospective or planned mission. As recently as 2014, the Golden Spike Co. advertised tourism trips to the lunar surface, with an estimated cost of between $500 million and $750 million. The company also announced plans to send robotic rovers to the lunar surface to help augment human scientific endeavors there. The company's website went dead around 2015, but Alan Stern, one of Golden Spike's founders (as well as a principal investigator for NASA's New Horizons mission to Pluto), told Space.com that Golden Spike is "still in business but awaiting a few external milestones to be achieved before moving forward on mission portfolio development." Compared with Golden Spike and Space Adventures, SpaceX appears to be in a strong position to actually get humans around the moon by 2018 (or perhaps by the end of the decade if the company's space station flights for NASA get delayed a year). A few other private companies are trying to reach the moon, but not with humans on board. There are currently five teams sill competing for the Google Lunar X Prize, which is challenging contestants to send a rover to surface of the moon by Dec. 31, 2017. Those five teams have secured contracts with launch providers. One of the teams recently announced it has secured full funding for the launch. To win the $20 million grand prize, a team must be the first to land a spacecraft on the moon, move it at least 1,640 feet (500 meters), and have the craft beam back high-resolution imagery to Earth. The moon, and the space around it, could soon be a territory readily explored by the commercial sector.